I met a very interesting person and her fictional sidekick Robin Bird a year or two ago (time flies when you’re having fun!) Rosemarie Pagano writes in a scientific mix of facts and faith, which is fascinating. 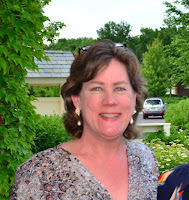 She writes articles for education magazines such as Schoolhouse Teachers and Molly Green, while maintaining her Robin Bird Explorer website and working to boot. Q) When did your sidekick Robin come into existence? A) Robin Bird was hatched around 10 years ago. I was sitting outside on my deck watching the birds. They’ve always fascinated me. I grew up with canaries and parakeets and my mom’s enthusiasm for birds and wildlife was infectious. We always took time to stop and watch the birds. A robin pulled a worm out of the ground. I had seen that happen many times. I loved the way they tilt their heads before pouncing on the worm. This, I learned recently, was not because they could hear the worms. Worms aren’t particularly noisy, but the robin feels their vibrations as they move through the soil. This sparked an idea. I got out my blue gel pen and graph paper (yes, I am quirky about my writing tools) and started to write. Robyn Byrd. I got fancy with the spelling and gave her some characteristics. She had siblings and they all lived in a treehouse. Hey, a story was hatching! Q) So how did Robin develop to where she is now? A) My first super rough draft was about Robin Bird (I changed the spelling to be more SEO friendly) and her bird sisters Jay and Wren. Their parents left the nest long ago and flew to live in Florida. Robin was quiet and studied worms. She was an oddball because, instead of eating worms, she collected them and kept them in a worm bin, as pets. Wren was a tiny, nonstop talker who wore tweed suits. She was a busybody who chirped into everyone’s business. Jay was a loud and bossy Blue Jay who coached a girl birds volleyball team. Imagine birds playing volleyball! Anything goes in the super rough draft. Jay had a bright blue Mohawk and blew a whistle at everyone. The Bird sisters lived in a giant treehouse in the quiet town of Roundtree. This treehouse was the largest in North America. Wow. The neighbors were people. Again, anything goes in a super rough draft. They didn’t like the mess and the noise the Bird sisters made and complained constantly about them. Jay swept her peanut shells off the treehouse porch every day and they’d land on Mrs. Parson’s picnic table. Wren’s constant chirping and chattering, plus Jay’s whistle blowing, forced the neighbors to close their windows. Sleeping in past sunrise was impossible on the weekends with birds as neighbors. Because this was a nice story, drama came in the form of flooding rain. The neighbors, who lived in houses, panicked and looked for higher ground. Roundtree was as flat as a stepped-on pancake. The Bird sisters looked down from their high perch in the treehouse and the neighbors looked up at them as the water rose up to their knobby knees. The Bird sisters huddled and Wren’s chirping became a whisper. Jay blew her whistle and Robin quickly dropped the rope ladder. Wren set the table and got busy making ants on a log for a snack. The neighbors stopped complaining about their wet feet and climbed up the shaky rope ladder. Mrs. Parsons had the hardest time when her big, wet (size 11) feet kept getting stuck in the rungs. Twelve neighbors fit comfortably in the giant treehouse and munched the ants on a log. They waited until the flooding stopped and appreciated the hospitality and kindness of the Bird sisters. Q) Why did you choose Robin and science as your writerly focus? A) I have a biology degree and experience working in medical microbiology. I don’t like worms. But, as I researched vermicomposting, I became fascinated with the incredible work they do. They really are tiny tillers and rock star composters. I put this story in the drawer for another year. Who wants to read about talking birds? No one. I focused on other topics and enrolled in a fiction course through the Institute of Children’s Literature. Robin Bird came out of the drawer and I made her into a girl. She wore brown corduroy shorts, a bright orange T-shirt and carried a doctor’s bag filled with worm collecting tools. 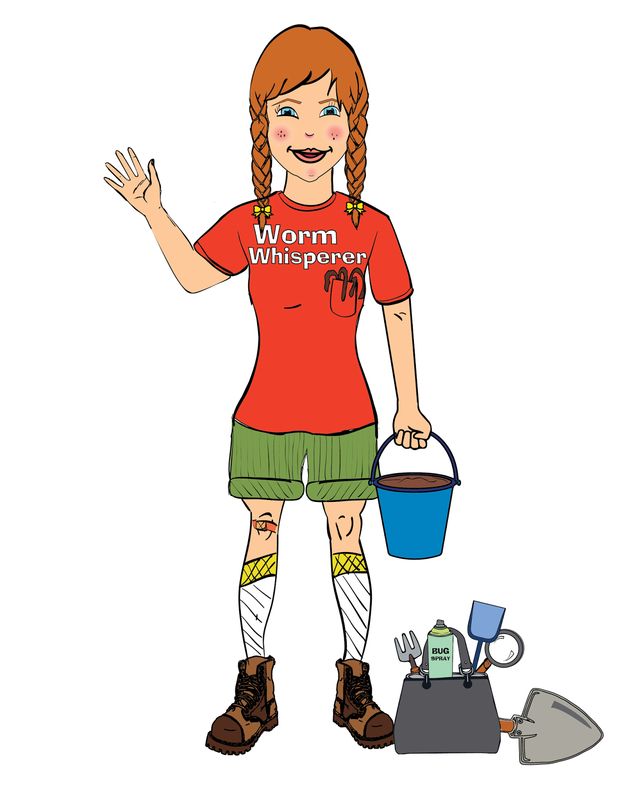 She called herself the “Worm Whisperer” and set up a Wormatorium in her basement. She had parents and two older siblings, Jay and Wren. No one understood Robin and no one had the worm love. It was a boring story that screeched to a halt. I didn’t give up. I went to several writers’ conferences to seek expert advice. One editor suggested I change Robin to a boy. Another suggested my secondary character, Wallace, take over. Each suggestion left me more confused and frustrated. So I put the whole pile of pages, drawings, worm notes, and research back into a larger drawer and stepped away, again. I knew it wasn’t the end of Robin Bird. She had so much to say. I just didn’t know how to let her tell her story. Q) What unexpected things have happened to you along the way? Wow, that was my light bulb moment! I love science and I love Robin Bird, but to put them together was a major breakthrough. Ideas started to flow. I started to “see” Robin Bird as a curious explorer enthusiastically teaching cool science subjects. I will always be thankful to Esther for opening a can of worms! Q) What’s next for you on your writing journey? A) What an incredible journey I have had with Robin Bird! I am so grateful for the Lord ordering each and every step of this journey. It isn’t over. I am grateful for the opportunity to share science and nature with young explorers. Another part of the journey is to create more online Bible study courses. I am currently working on Psalm 104. Interested in finding out more about Robin Bird and Rosemarie?